Mix light ricotta with coconut flour and stevia to your taste. 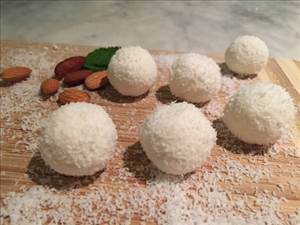 Make 10 pellets with one dry roasted almond inside of each candy and roll each one in coconut flakes. Freeze for 10 minutes and enjoy. There are 29 calories in 1 serving of Rafaello. Calorie Breakdown: 56% fat, 23% carbs, 20% prot.